Top 100 VARS list recognizes the top Value Added Resellers (VARs) of accounting software. 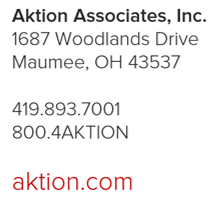 Maumee, OH, July 17, 2017 – Aktion Associates, a leading business consulting and technology solution provider, announced today that Accounting Today has named Aktion Associates to its 2017 VAR 100 list. The VAR 100 list is an annual report that ranks the top resellers of accounting software in the United States. Aktion ranked #24 on the VAR 100 list. “We’re pleased to be included on this list,” said Scott Irwin, CEO, Aktion Associates. “We know we’re delivering value to our customers and providing the best accounting software on the market,” he added. Aktion Associates provides industry consulting services and technology solutions to mid-market businesses. Aktion’s accounting software deliverables include Sage 100 Contractor, Sage 300 Construction & Real Estate, and Acumatica. Aktion partners with other technology innovators including IBM, HPe, and Microsoft to deliver a complete technology infrastructure solution. More than 4,500 clients reward us with their partnership and choose Aktion as their technology advisor.